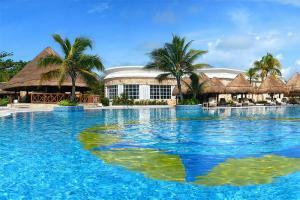 This all-inclusive, adults-only resort is surrounded by native jungle trees, local plants, mangroves and Cenotes. The resort's layout ensures that all rooms offer spectacular views. Take a culinary journey around the world at seven restaurants. Rooms and suites feature offer conveniences such as HDTV and WiFi. Take in the beauty of your surroundings from your terrace or balcony. Soak in the sun at the beach or pool and enjoy plenty of outdoor activities such as paddleboarding, snorkeling, kayaking and more. Located about 15 miles from Playa del Carmen and Tulum’s archeological site, and 52 miles south of Cancun International airport.